This item is not available for purchase online. Please call (720) 635-7873 for more information. Ideal for advanced riders and newbies alike due to their ease of use and performance in a wide variety of conditions. Performer paddles are light, durable and designed for smooth yet powerful propulsion with a clean entry into the water and crisp exit at the end of the stroke. 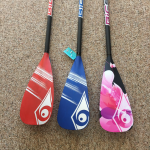 Whether your Touring, Racing, SUP Surfing or just cruising around your local lake, Performer paddles are a joy to use. CF - Carbon shaft / Fiberglass blade Optimized flex for improved comfort and performance, LeverLock™ adjustment. Standard - 90 square inch blade / 67-83 inch adjustment range*: Our most popular blade. Extremely smooth and responsive, the perfect size for all-round use. Available in Blue or Wahine. Large - 100 square inch blade / 75-90 inch adjustment range*: Excellent power output for larger paddlers and those with a lower cadence stroke. Available in Red. LeverLock™ Adjustment System We’ve tested them all and this is the best adjustment system we’ve found. The feel and performance of a fixed-length paddle with the versatility and convenience of an adjustable. Featuring an infinite adjustment range, no clunky adjustment mechanism to get in the way and no parts to lose. Made of rugged polycarbonate, fiberglass and stainless steel for maximum durability and performance.